Our new Mini Logo™ high-performance trucks combine strength, stability, and smooth turning in a lightweight design with premium alloys, high-rebound bushings, and precision axles. Developed and tested at Skate One, the shape, materials, and finishes have been refined for MILITANT skaters right from the first turns and grinds -- No break-in time needed! I was a little reluctant to try these but they are now my favorite trucks. Don't let the price fool you; these are a solid truck that punches above it's weight class. I run the 8.75" version on several 10" Peralta reissues without issues. They are low profile compared to standard Indy's so I run a 1/8" riser with 60mm wheels for clearance. For the Old School riders who might think these are too narrow for a 10" deck; they work fine with a wide 60mm wheel such as the Rat Bones or equivalent size and still offer great stability and turning radius. While the provided white bushings are good; I prefer the Bones hard bushings which really changes the way the truck feels. Another big benefit is the lightweight design; they're only 12 grams heavier than the top of the line Indy 159 Forged Titanium at a fraction of the cost. 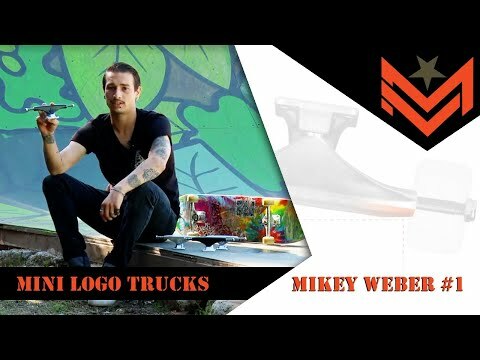 Speaking of weight; if you're into riding a light weight set up; use these trucks on a Flight deck with a set up of Mini Logo wheels.